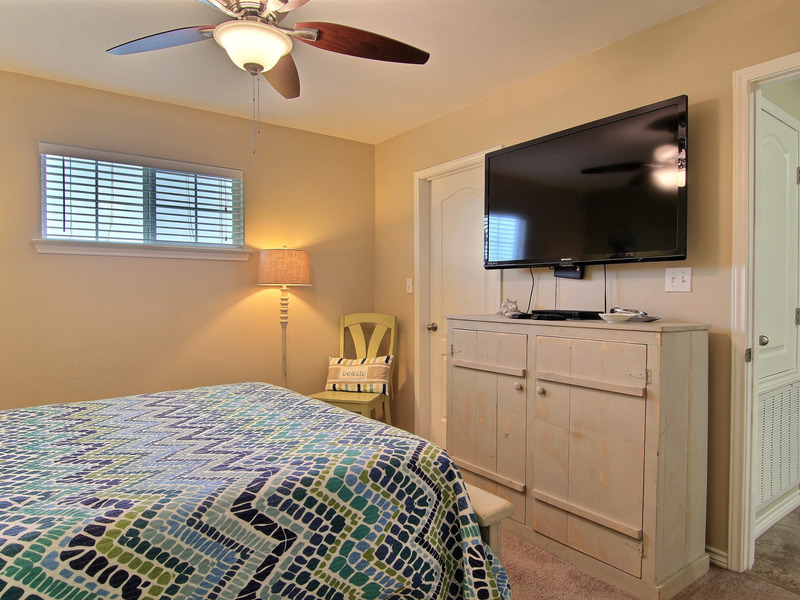 free golf cart, private pool, shuffleboard, close to beach, close to town, tv's in every room, lots of DVD's, & pet friendly. 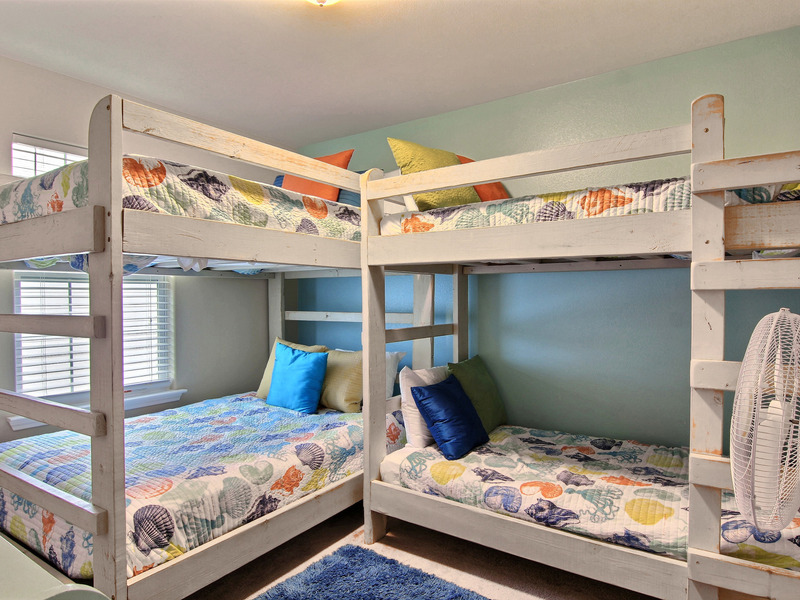 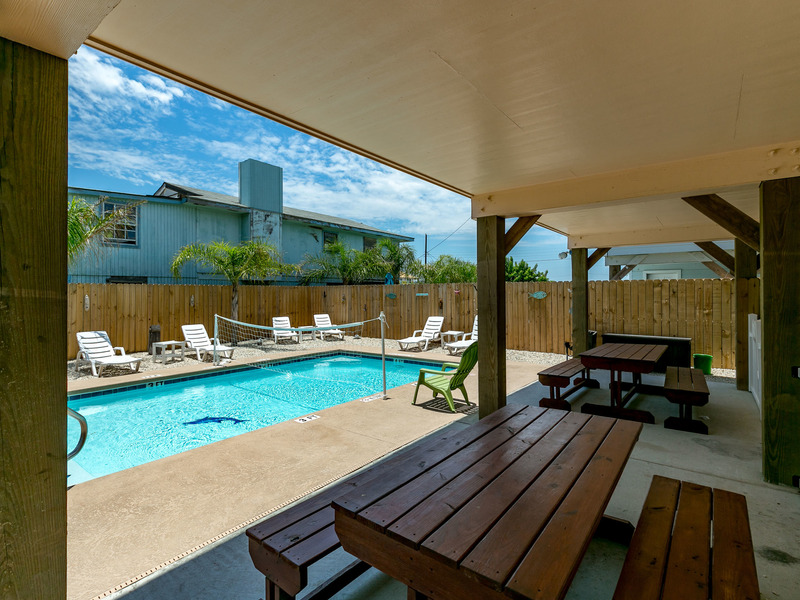 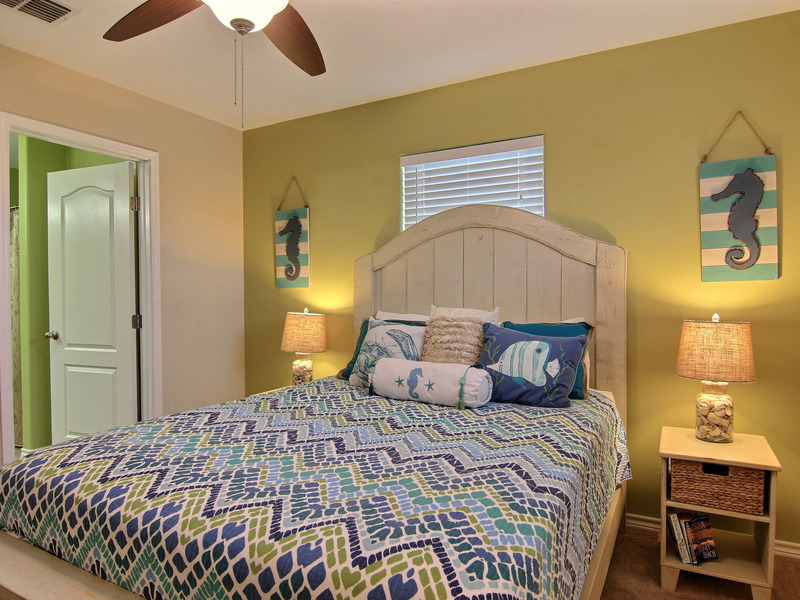 Perfect for the guest who wants to enjoy the finest port aransas has to offer! 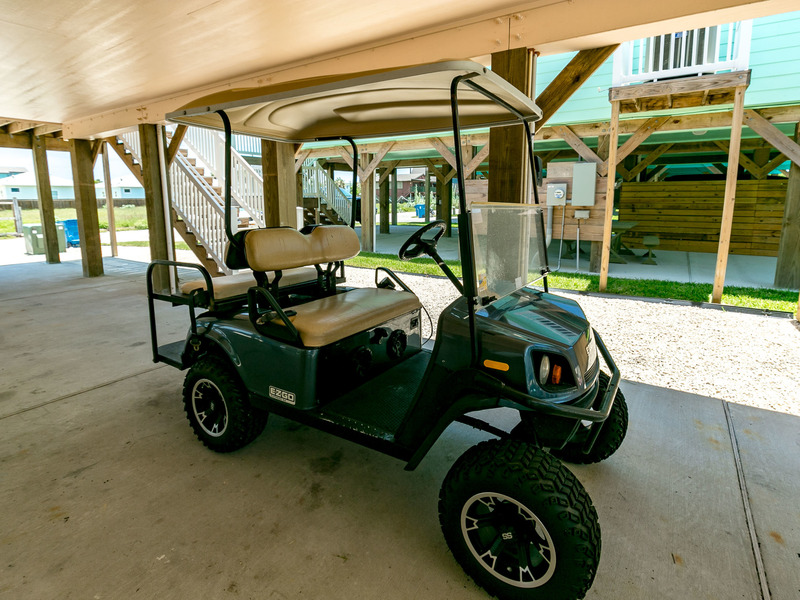 "sandy bottom", has one of the best locations, where it is close enough to town to drive the free golf cart, and less than a few blocks to the beach. 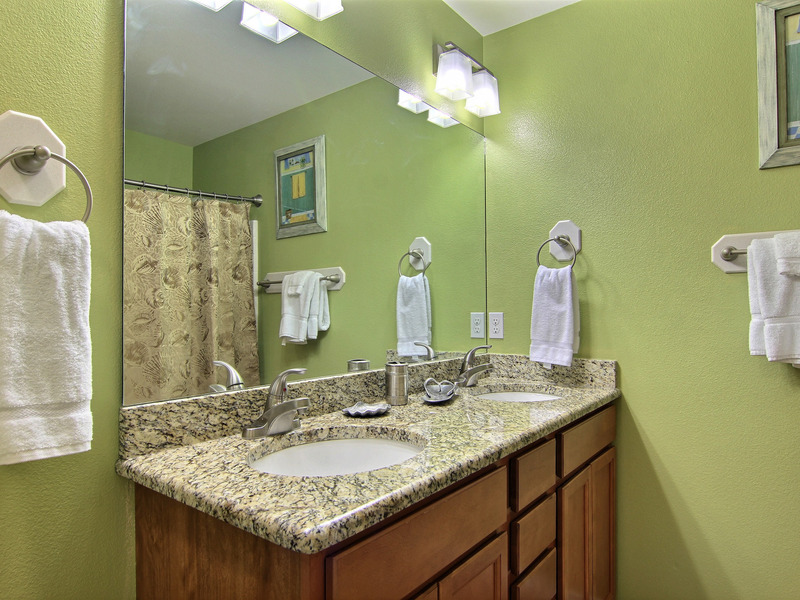 This three bedroom, two bath house will amaze you with it's extraordinary décor and attention to detail. 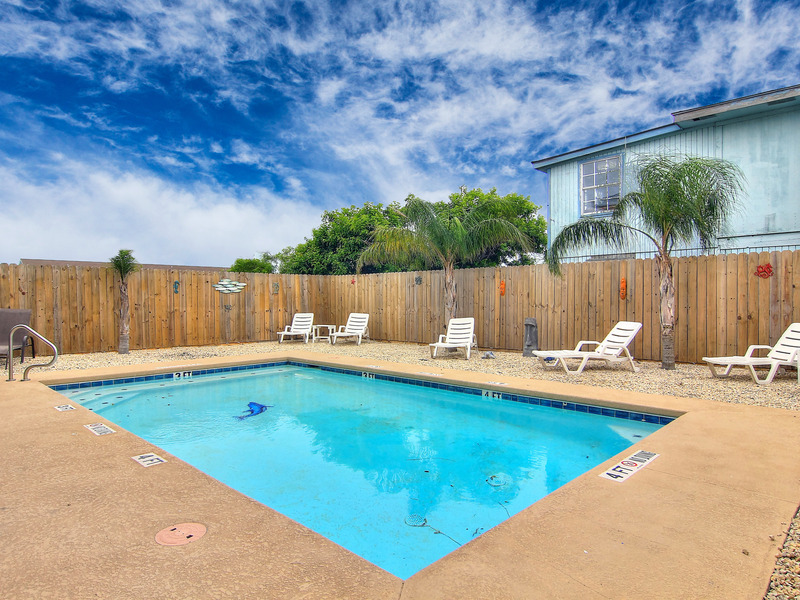 What a better way to start your Port Aransas vacation, than by hanging out at "sandy bottom's" private pool! 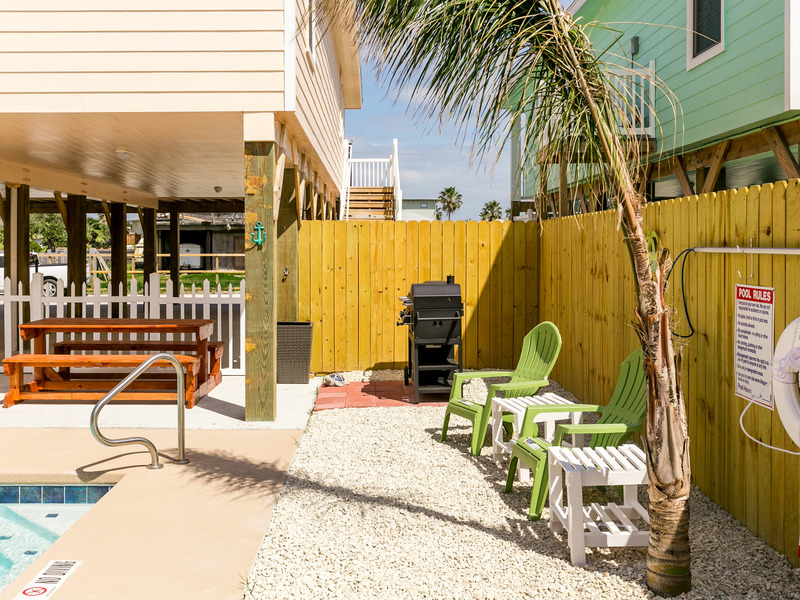 With plenty of chaise lounges and entertaining space you can catch the ocean breeze and grill out your local catch of the day with either the charcoal or gas grill! 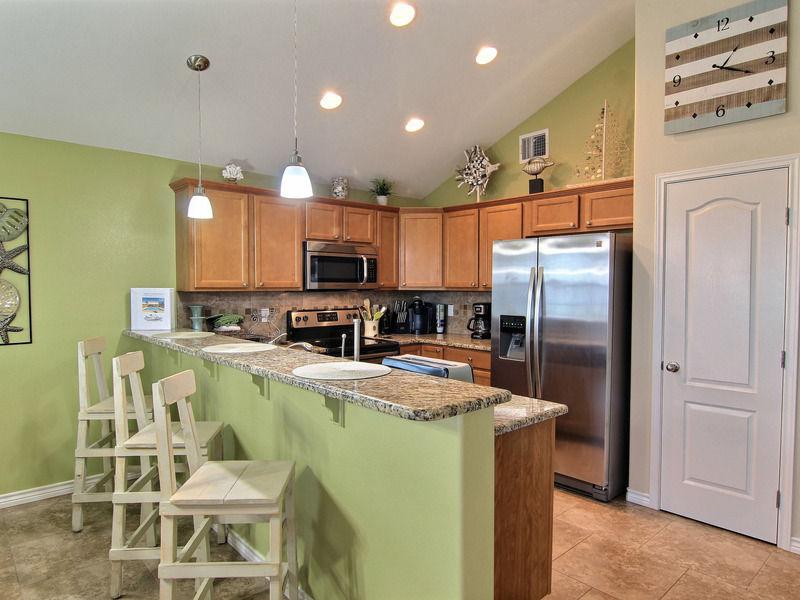 Make a trip to the beach more hassle free by using the 16 quart wheeled ice chest cooler. 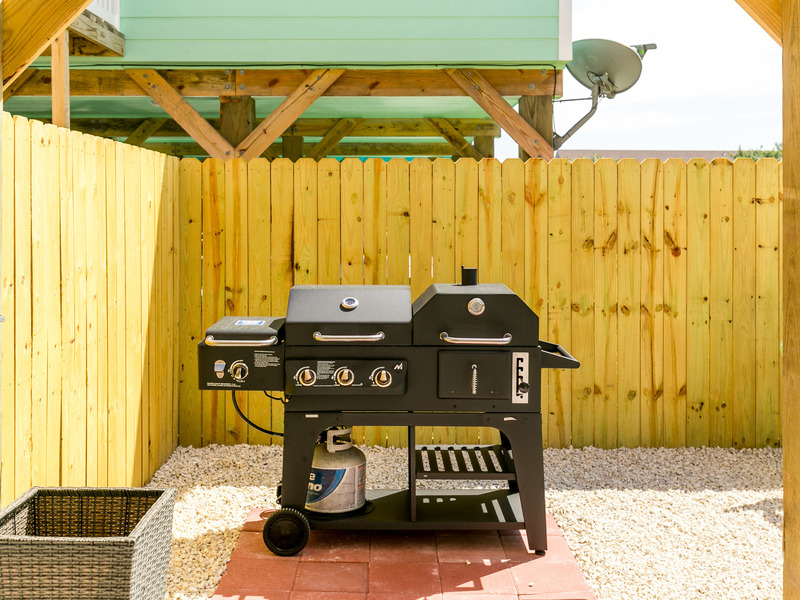 Rinse off the gulf coast sand with an outdoor shower. 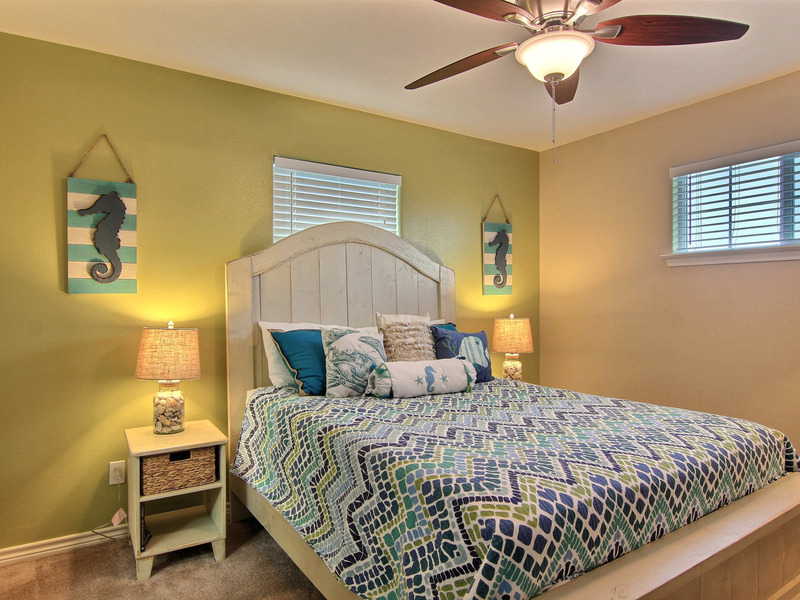 As you enter the front door you are greeted by a large open floor plan with a seaside feel. 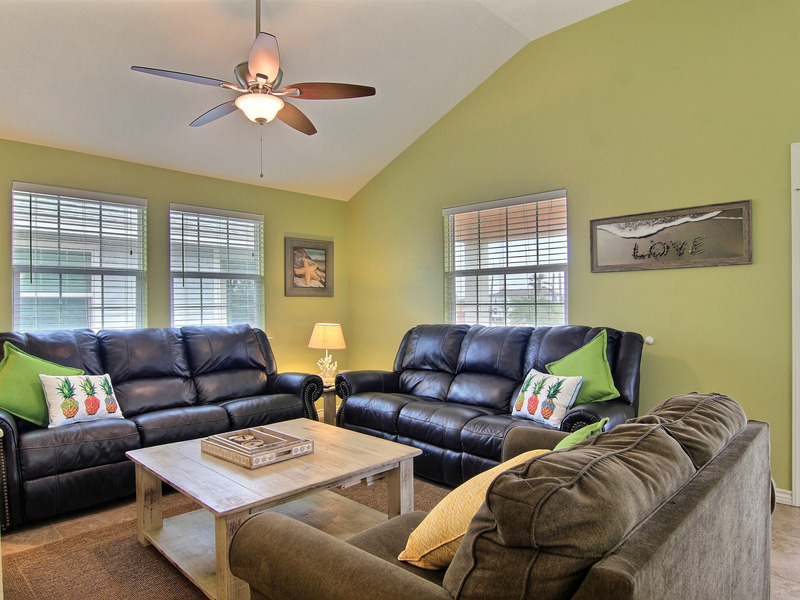 The living room has a comfortable sitting area with plush sofas and lounge chairs. 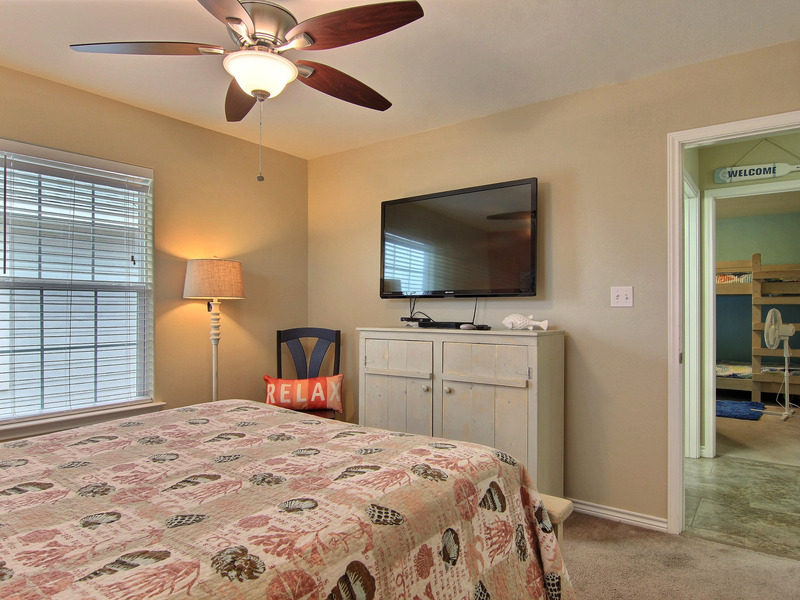 With over 50 DVD's included you can relax after a day in the sun and watch your favourite movie on the 55" flat screen TV. 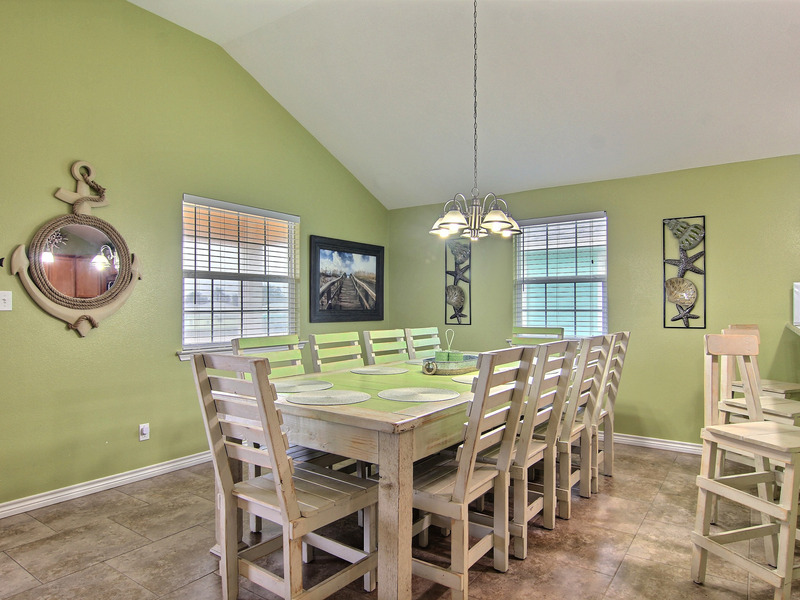 Visible from the living room, is a spacious dining/kitchen area. 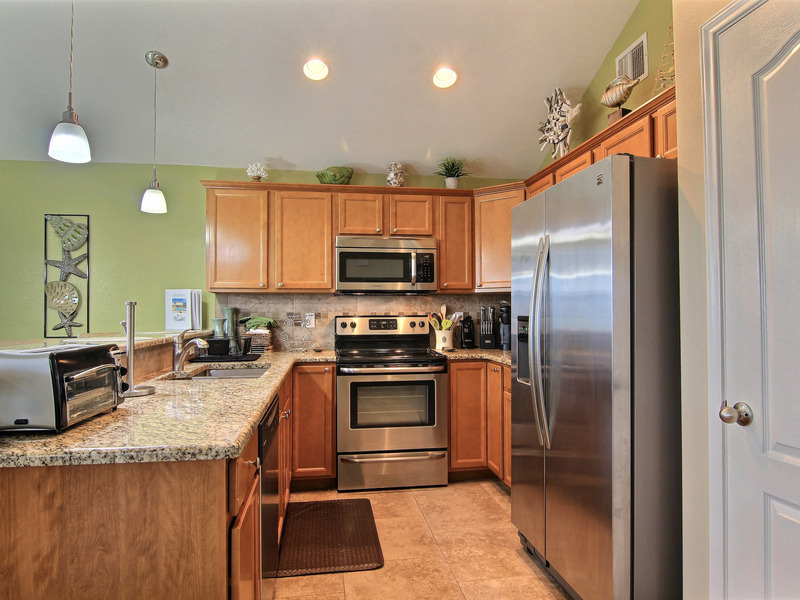 The kitchen includes a double door refrigerator with ice maker, dishwasher, glass top stove, disposal, keurig, blender, granite counter tops and uniquely designed tile background. 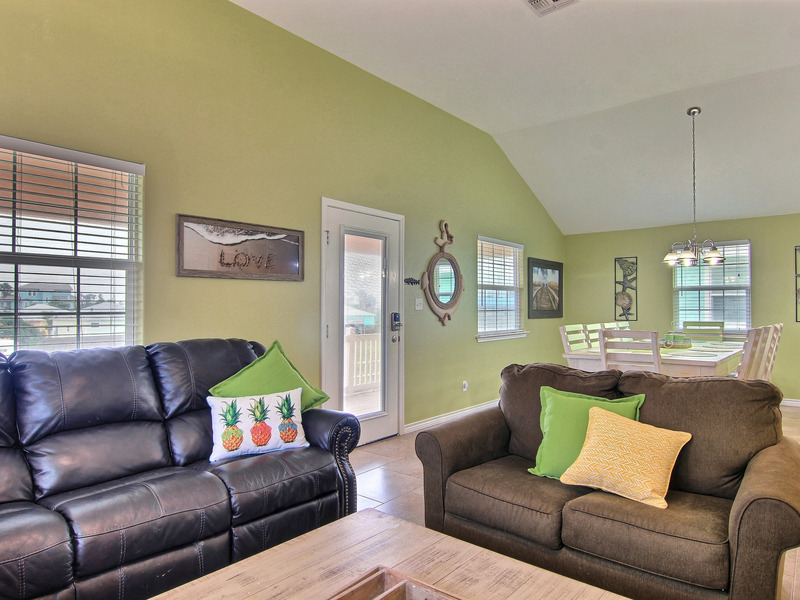 Light pours into this expansive, luxurious great room. 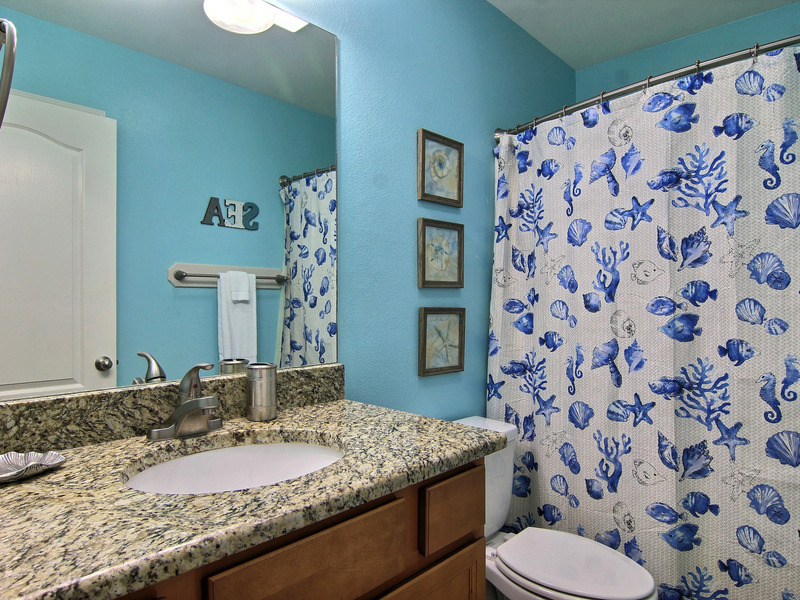 Tile throughout the home blend beautifully with the elegantly appointed high end furnishings. 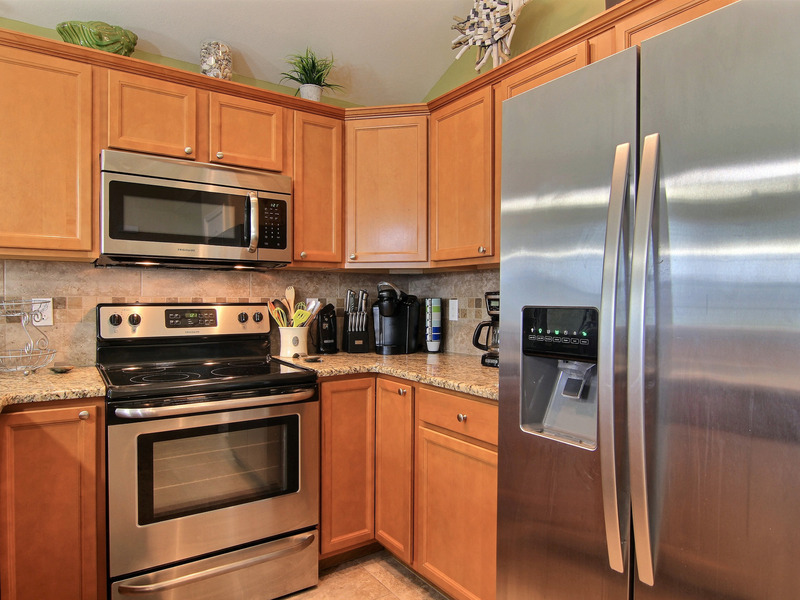 Enjoy the ten person dining and three person breakfast bar just steps away from the stylish living room. 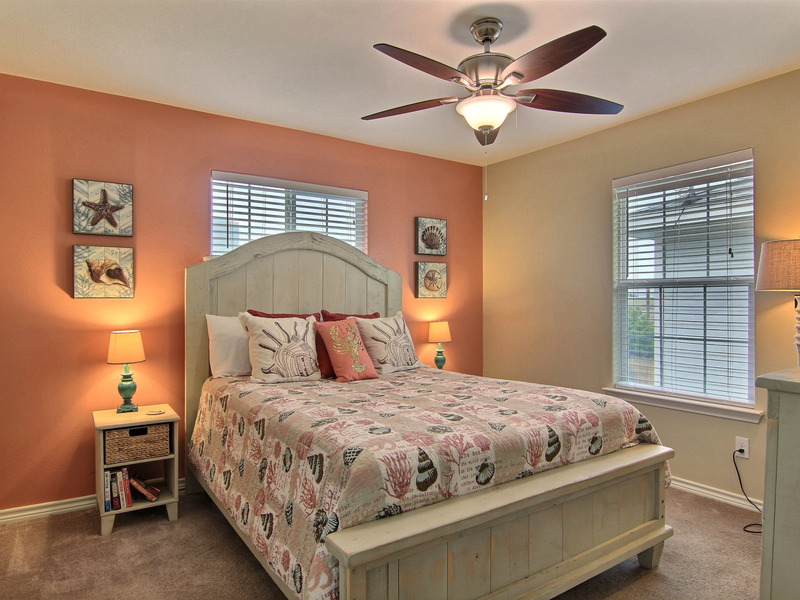 You will enjoy the distinct details that "sandy bottom" has to offer. 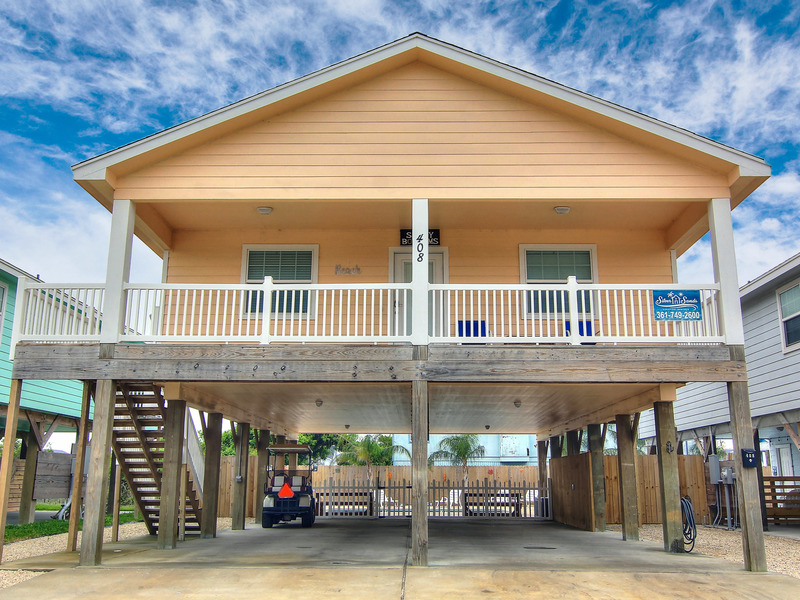 Be one the first to rent this spectacular beach home. 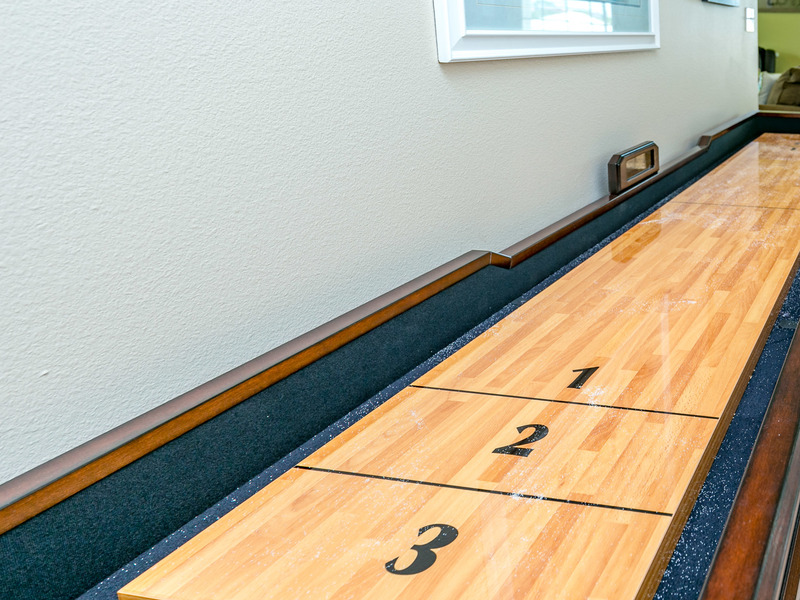 Take advantage of the shuffleboard, Private Pool, Board games, Books, over 50 DVD's, picnic tables and outdoor lounge chairs, pool toys and much more! 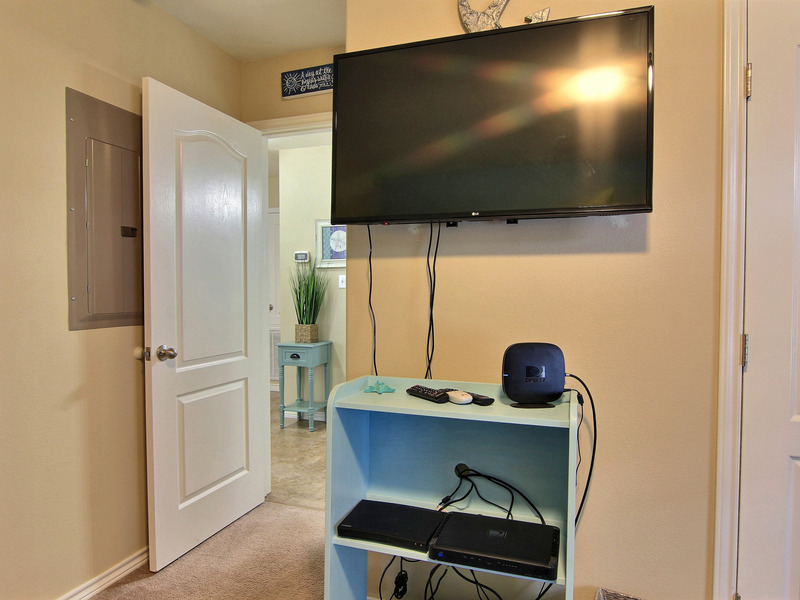 Additional Feature for your entertainment: Cable TV, Books, Games, Iron and Ironing Board, Blow Dryer, Shuffleboard, 4 DVD Players with 50 DVD's available for your use, 4 Flat Screen TV's a TV in every bedroom. 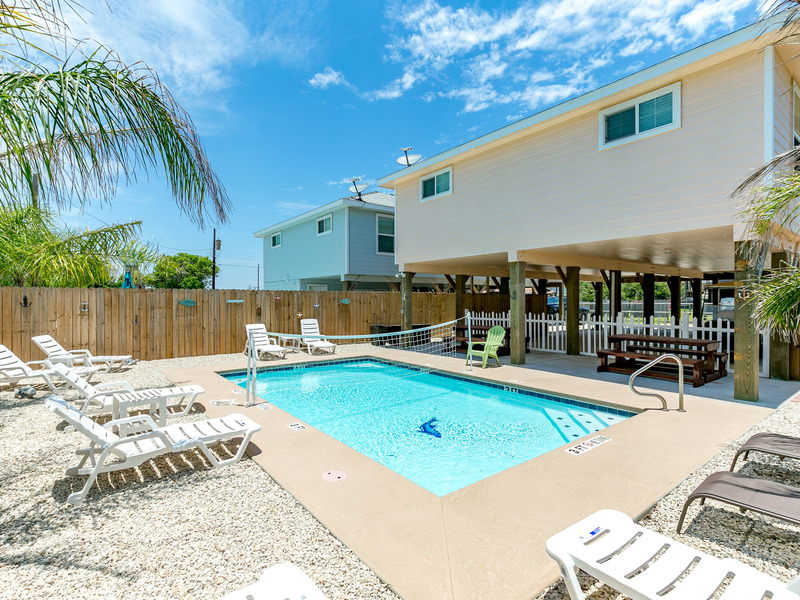 Outdoor Fun: Fully fenced in yard/pool area for your pet & children. 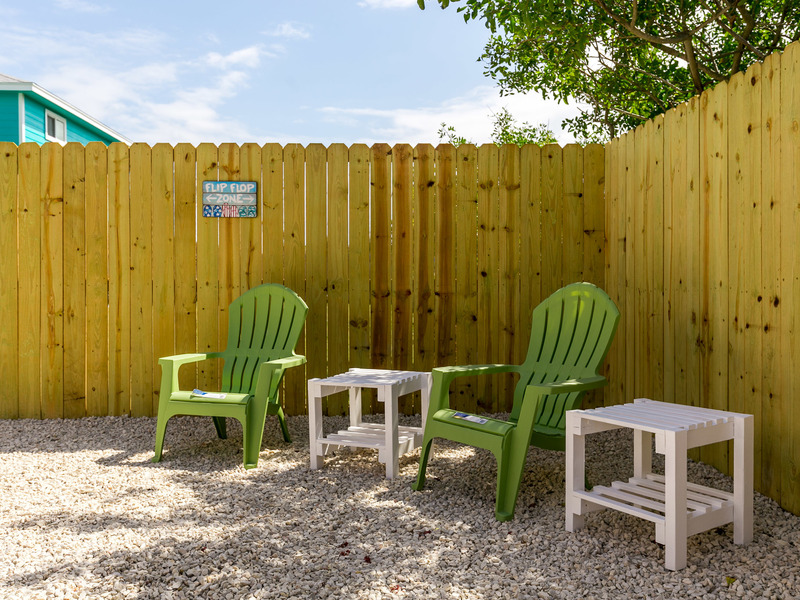 2 picnic tables for dinner alfresco! 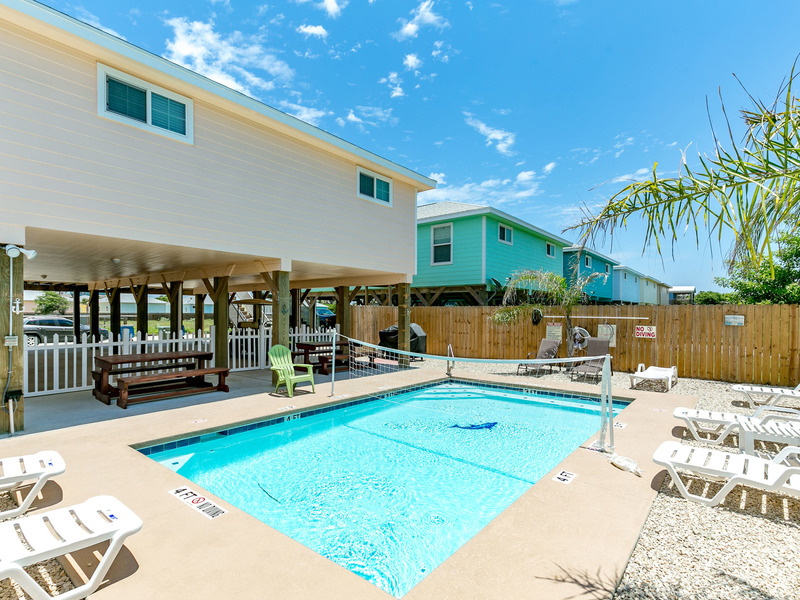 Additional Features: Private Pool, Free Golf Cart, Flat screen TV's in Every Room, 16 Quart Wheeled Ice Chest, Pet Friendly, Wifi, Picnic Tables, Iron and Ironing Board, Blow Dryer, 4 DVD Players, Close to Town, Washer/Dryer, BBQ Charcoal/Gas Grill, Shuffleboard, Books, Board Games, Towels & Linens, Private Balcony, Concierge service available. 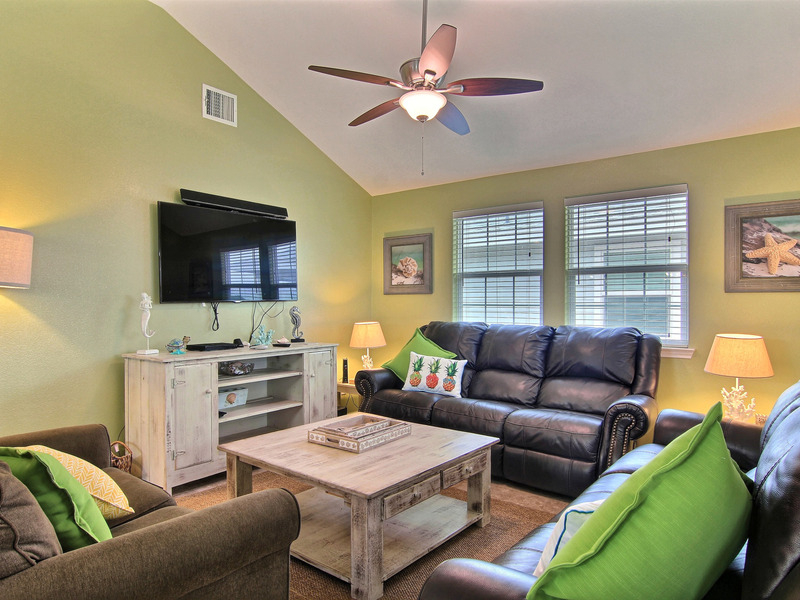 Entertainment : Cable TV, Golf Cart with rental, Books, Golf Cart Available, Games, Shuffleboard, 4 DVD Players, 4 Flat Screen TV's.